The adventures of Green Lantern Kyle Rayner, especially at the outset, were always a little more character-based than the space-faring antics of Hal Jordan and others. In the beginning, one could as often expect Kyle to be caught up in relationship tangles with Donna Troy or worrying what Jade's father Alan Scott would think of him as he might be fighting super-villains. More than once writer Ron Marz's title seemed to reflect the Friends aesthetic among the mid-1990s DC Comics set. In his work on the character, writer Tony Bedard has preserved the Kyle Rayner tradition well, perhaps even too well. 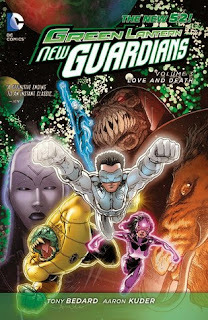 Green Lantern: New Guardians Vol. 3: Love and Death, Bedard's final volume on the title, largely focuses on Kyle's emotional well-being and awakening, at times even eschewing the plot to do so. Love and Death delivers what you want from a Kyle Rayner story, which is good; at the same time, Bedard glosses over a lot of details, and the stories here are so tertiary to the larger ongoing Green Lantern story as to make them feel at times like an afterthought. Like the other third volume Green Lantern books, Love and Death collects the New Guardians tie-ins to the "Rise of the Third Army" and "Wrath of the First Lantern" crossovers. Basically this volume is split in two; the first five issues (the Zero Month issue plus #13-16) corresponding to "Third Army" while the final five issues (#17-20 plus Green Lantern #20) correspond to "First Lantern." Both stories find Kyle and friends on the sidelines, as opposed to the more-connected Green Lantern and Corps titles. In the first story, Star Sapphire Carol Ferris "gets a vision" that Kyle must learn to harness the powers of the multi-hued Lantern corps, so off they go, and in each of the four issues Kyle gets a different object lesson in rage, fear, and so on (it's indicative that Bedard's story needs no greater plot impetus than that one character has a vision that's what they should do). The story ends with Kyle and friends vowing to "take the fight to Oa"; they do, in the Green Lantern Corps Annual #1, but this doesn't amount to much more than Kyle's group flying in, quipping a bit, and then unexceptionally joining the Green Lantern battle already in progress. The second story, the "First Lantern" tie-in, has as its conceit across the Green Lantern titles that the First Lantern can view alternate realities, so almost every title's issue #17-18 are "what if" tales that largely don't affect the main plot -- issue #17 focusing on Kyle and issue #18 focusing on Carol. Issue #19 has Kyle and Carol encountering Sinestro between the pages of Green Lantern #19 and #20, but indeed this is so "between the pages" that Green Lantern #20 nearly contradicts it; it's clear whatever pieces Bedard moves here, he has to put them neatly back in place in the end such as not to interrupt the plans of the other titles. This leads into Green Lantern #20, where again, Kyle's group flies in and then fades into the background of the story already in progress. It is surprising that Kyle's adventures amount to so little, given that Bedard would seem to arrive at an important climax in the story he's telling -- Kyle's evolution to becoming a White Lantern. This is certainly an interesting turn for the character, and his ability to harness the powers of all the Corps makes Kyle immensely powerful and worth watching. But as far as Bedard explains it, Kyle only seems to gain these powers through a malfunction in his ring, and we never get the sense Kyle is special or "chosen" for these powers, and said powers, while impressive, never have an overarching role or purpose in the larger story. There's plenty potential here, but it doesn't come to anything in the end. Fortunately, the reader is left with fairly cogent Kyle Rayner stories in their own right. The joy of New Guardians has been a title that spotlights Geoff Johns's wild and wooly members of the other Lantern corps, and there's plenty of fun to be had in watching Kyle try to master rage with Atrocitus, fear with Arkillo, and so on. The second story deals both with Kyle's late girlfriend Alex and his estranged father (both historic Kyle Rayner elements brought forward into the New 52), and Bedard underscores Kyle's very human emotions as Marz and Judd Winick did before him. The book also benefits greatly from Bedard's inclusion of Carol Ferris, and in a sensible Star Sapphire costume, too; perhaps one of the most unfortunate things about Bedard departing this title is that it leaves up in the air whether Carol will continue to share the book. Bedard does well in making this book feel genuinely like a Kyle Rayner story with the inclusion of Alex, Aaron Rayner, and the Guardian Ganthet, but I couldn't help but be disappointed that Bedard seems to flub some details of what's essentially our first look at Kyle's origins. One of Kyle's enemies still killed Alex in the New 52, but Bedard's omission of the enemy's name seems glaring (likely because the powers that be haven't decided who that enemy is). Kyle is supposedly still "the Torchbearer" in the new continuity, meaning he was the sole Green Lantern for a while after Hal Jordan went mad, but if that's the case then Bedard's flashbacks to Ganthet showing Kyle around Oa, references to Kyle beginning his training with Kilowog, and a surprise party Kyle throws for Ganthet with Hal Jordan, Arisia, Guy Gardner, and others in attendance really make no sense. Bedard seems to shift the facts to suit what emotional beats the story needs without considering the larger lore, a disservice to fans. For three volumes this book has seemed to me to hold a lot of potential, but again with Tony Bedard's Green Lantern: New Guardians Vol. 3: Love and Death, it never quite seems to live up to what it could be. Such, I fear, is the fate of all books that spin-off themselves from spin-offs (see the recently cancelled Batman: The Dark Knight as another example). I'd be remiss if I didn't mention artist Aaron Kuder here, whose compact figures evoke Frank Quitely at times; Kuder gives this book a distinct look that provides a much-needed boost at times. Coming up, Injustice: Gods Among Us Vol. 2.